Darts are a common commodity in pubs and home bars across the world. While these small projectiles may look simple to the untrained eye, they have evolved quite a bit in the past century. Modern darts are engineered to perfection. They can be made from a wide variety of materials. Like all competitive sports gear, darts come in all shapes and sizes. These factors aren’t just for looks. Subtle changes in a dart’s shape and weight can ultimately affect its flight trajectory. This, in turn, changes its performance. With a game that’s all about technique and precision, even the smallest detail can make a world of difference. Aspiring players who want to dive head first into the world of darts have many options to choose from. It can be a daunting task to find a dart set that’s right for you. To help you out on your search, here’s a collection of some of the best steel and soft tip darts that money can buy. These steel tip darts are beautifully designed. They have a barrel that’s made up of 95 percent tungsten. The material is very tough. It’s also dense, allowing you to achieve more accuracy when you throw. A knurled grip design is used. It’s accompanied by 11 painted black rings on the back of the barrel. Aluminum is used for the shafts. The lightweight material matches the look of the tungsten. These darts come with standard flights, a point sharpener, and a handy carrying case. From K.O. Darts is this set of three darts. The darts weigh approximately 24 grams and feature a relatively even barrel. Multiple grooves are carved into the barrel to maximize grip as you throw. The barrels are made of 90 percent tungsten. The shafts are made out of lightweight plastic to ensure that you can make your shot comfortably. Bright red flights are included. They’re standard flights, making these darts a great option for novice players. With its black body and gold accents, these darts look very sleek. The barrels are made out of polished brass. The material provides a modern look. Knurled grips are machined into the brass. To add some visual contrast, the machined lines are painted black. 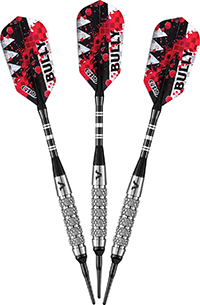 The darts come with aluminum shafts and standard flights. The shaft is black to blend in with the barrel. The flights feature brass artwork. The overall weight of the darts is about 24 grams. 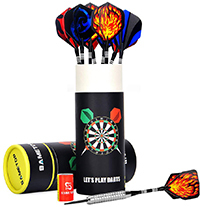 This dart set from Sametop can add some color to your game room. The darts have barrels made out of steel. The steel is plated in nickel silver for an attractive finish.To give you better grip as you’re setting up your shot, the barrels have etched cutouts. The shafts are made from aluminum. The material is light, yet durable enough to withstand heavy play.Poly Pro flights are used. They’re specifically designed to provide you with more speed during your throw. Each dart set comes with four distinct flight designs. 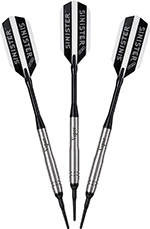 If you’re looking to improve your game, these steel tip darts may be for you. They feature brass barrels. A knurled grip is etched into the metal. The darts are also available with colorful gems. The gems add some flair while also improving grip even more. The barrels weigh 18 grams, making them a great option for beginners. Aluminum shafts are used. They have rubber rings on them to prevent any loosening that might occur during a game. The set includes a carrying case and sharpener for your convenience. These soft tip darts from Viper are available with a few different barrel designs to match your playing style. You can get a contoured barrel for more comfort, a beveled barrel with slightly more weight on the front-end, and a teardrop barrel with more subtle weight distribution. The barrels are made from 95 percent tungsten. They look great and feel nice in the hand. An aluminum shaft and standard flights are also included. The darts are available with a weight of either 16 or 18 grams. If you want darts that stand out, take a look at this option from Target Darts. The barrel is made out of sleek titanium. each barrel also has a Pixel grip. This unique design has small holes and tiny arches. The holes are sectioned off to give the barrel a stylish look. Overall, the barrel has a weight of only 16 grams. This makes it accessible to new and seasoned players. Nylon shafts are included. They screw onto the barrel for a seamless appearance. This kit provides you with everything you need to take care of your darts. It includes a convenient carrying case, extra nylon shafts, a dart mechanic wrench, and flight protectors. The darts themselves have a barrel that’s made of 80 percent tungsten and 20 percent nickel. It weighs 18 grams for ultimate versatility. Knurled bands run along the length of the barrel for better grip. You can also choose between a coarse knurling pattern or a medium knurling pattern. The shafts are made out of aluminum and feature locking holes to keep them secure as you play. These darts are also made out of 80 percent tungsten and 20 percent nickel. The materials are combined d and shaped to create perfect weight distribution. There are two different weight options. You can get 16 or 18 grams. When it comes to design, these darts do not disappoint. The grips utilize knurled bands, deep cutouts, raised rings, and textured accents. The grooves are painted for a unique look. You can get black, blue, or green paint to match your own personal style. The shafts are made out of corvex nylon. 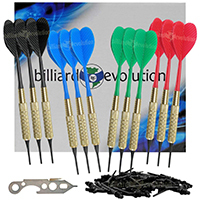 Get more bang for your buck with this dart set from Billiard Revolution. It includes 12 brass-barreled darts. The barrels have a weight of just 16 grams, so they can be used by just about anyone. To enhance your grip, each barrel has etched lines. The shaft and flight are molded into one singular unit. Four different colors are included. The shafts screw into the barrels with the included dart wrench. 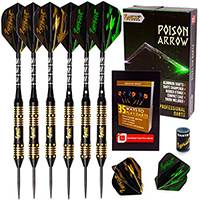 These days, you can easily find great options for both steel tip darts and soft tips darts. If you’re wondering about the differences between the two, it all comes down to the board that you’re using. Soft tip darts are typically reserved for electronic boards. While they can certainly be used on a traditional bristle board, the soft tips are specifically designed to fit into the holes of a plastic board. As the name implies, the tips on these boards are a lot softer than steel. As a result, they’re often the go-to option for casual pubs and homes. Let’s face it, darts can be dangerous. They’re flying projectiles that could easily puncture through a wall or someone’s skin. Soft tip darts were designed to decrease the risks. 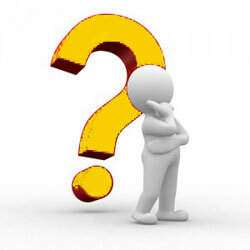 In fact, many establishments opt to go with soft tips because of liability issues. With that being said, soft tip darts and electronic boards do have their downsides. One of the biggest is bounce back. The design of electronic boards limits where a dart can go. While the board is covered in holes, there’s always the chance of hitting a solid portion of the board, which results in the dart bouncing back toward you. Steel tip darts are much more durable. A high-quality dart set can last you for many years if its properly taken care of. They also have more expensive materials along the barrel and shaft. 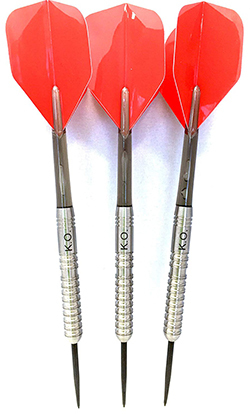 The biggest benefit of steel tip darts is their weight and density. They tend to be much heavier than soft tip alternatives, making them easier to control during a throw. The sharp point of steel tips is ideal for bristle boards. Contrary to popular belief, darts don’t actually penetrate a solid surface when they hit the board. Instead, the tip separates the bristle fibers of the board, causing it to stick. At the end of the day, the type of dart that’s right for you all comes down to personal preference. In the past, steel tips were the most common. Even to this day, some dart purists refuse to use anything but steel tip darts because of the game’s history. 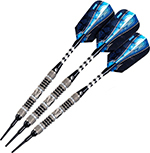 However, soft tip darts have gotten very popular in recent years. The advent of electronic boards made them much more prevalent. As more an more electric game boards starting popping up, seasoned players began warming up to them. Today, there’s very little bias between the two. In fact, many competitive players are proficient with both types of darts. Once you decide whether you want steel tip darts or soft tip darts, you can start to get into the finer details of dart design. There are many factors to consider when you’re choosing the right dart set for you. Understanding how certain elements can affect the dart’s performance can help you narrow down your options. The weight of the dart can ultimately make or break your playing technique. It’s a lot like bowling. Players often go through a lot of trial an error trying to find something that works for them. Dart weights can vary dramatically. They can be as light as 14 grams or as heavy as 50 grams. When you’re looking at an advertised weight, what you’re actually looking at is the weight of the barrel and point. The flights and shafts are not factored into this measurement. Soft tip darts often weigh less than steel tip models. However, it’s not difficult to find a soft tip dart in your preferred weight range. If you’re just getting started with darts, it’s recommended that you go with an option that weighs, at most, 22-24 grams. You could even go lighter to perfect your throws. Once you get familiar with the game and playing techniques, you can start experimenting with darts that fall outside of this range. 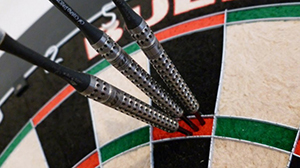 Darts can be made from a number of different materials. Many manufacturers actually incorporate a couple of different materials in a single dart design to achieve the desired weight. Barrels are often made of metals. 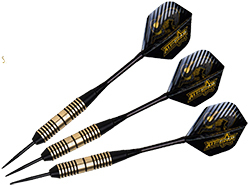 More affordable darts utilize brass or some kind of alloy. If you want something on the higher end of the price spectrum, you can get a tungsten barrel. Tungsten is known for its density. These barrels can be much thinner while maintaining significant weight. Dart shafts can also be made out of metal. However, light plastics are more common. The shaft of a dart refers to the component that holds the flights. It attaches to the back of the barrel. You’ll find shafts made out of nylon, aluminum, and carbon fiber. The materials you go with are important. Not only do they contribute to the overall weight of the dart, but they also affect its longevity. High-quality materials can withstand hard throws and years of playing. The shape of the barrel is one of the most important parts of a dart. This is because the barrel affects weight distribution throughout the dart. There are a plethora of different designs out there. The shape of the barrel can provide you with unique effects. For example, teardrop barrels are thicker on the front end. The trajectory of the dart can change mid-air because the throw leads with the heavy side. You can find standard pencil barrels, center-loaded barrels, and much more. Ultimately, the barrel that’s right for you will depend on how you play. There’s a special technique to master different weight distributions. You can match the barrel design to how you hold the dart. If you tend to hold towards the front of the barrel, you may do well with a front-loaded teardrop style. If you hold the dart in the middle, a standard pencil barrel with even distribution may be for you. The grip refers to the patterns that are etched onto the barrel. Darts can easily slip out of your hand, so having a suitable grip is crucial. 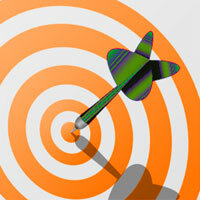 The right design can improve your accuracy and help you stay safe. Most players choose a grip through trial and error. The numerous designs feel different in the hand, so it’s not difficult to figure out which one feels best. Some also choose based on how they hold the dart. Some of the available grips include knurled, wave, shark fin, micro, and more. The dart flights are the wings on the back end. While they appear to only serve an aesthetic purpose, the shape of the flight can affect how the dart travels through the air. There are a number of different flight designs. The most common are Standard and Small. Standard flights are a good option for aspiring players. These flights are much larger, thus, they have more surface area. They can provide you with a more stable throw. Throws with a standard flight are very predictable, which is great if you’re worried about precision. Small flights have less surface area. They’re typically used by experienced players who have a fast and straight throw. It’s not recommended to start off with this type of flight, as it can lead to wobbling and instability. Darts are a lot more complex than most people think. Small details can make a huge difference in whether or not the dart is right for you. If you’re a new player aspiring for greatness, choosing high-quality darts is the first step towards success. With these tips in mind, you’ll have no problem finding a set that can help you dominate the board. Also read: Best DartBoard, Bristle or Electronic?